Description: 'The Acorn's Dream' A result of a walk in the park on a early Spring day. Leaves, frozen in, begin to thaw leaf-shaped pits in slowly melting ice. Techniques: The leaves were raked up from the yard last fall and scanned. Alpha map textures of the various leaves were produced, then arranged in a pleasing random manner in a 2D program. The resulting file was turned to a grayscale image height map and run thru tS4.3 and the extruder TSX to produce the ice object. A high poly count ice object, to boot! Painted with ShaderLab Cloudy Marble, and dielectric reflectance. Next, NURB planes and cylinders were painted with the various leave textures, and the nurbs were pushed and pulled into appropriate shapes. 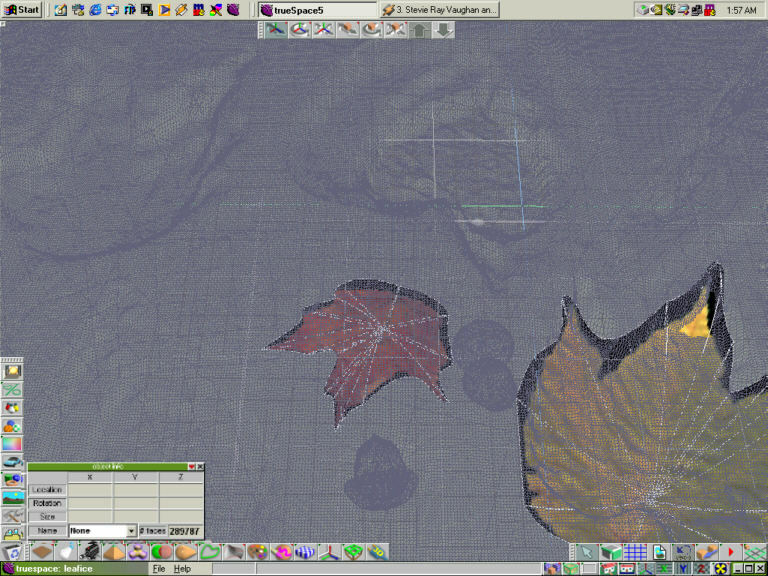 Symbiont and ShaderLab materials were layered over the existing alpha-maps, and the leaves were arrayed inside the ice object at various depths and angles. Assorted sticks and twigs were also scanned, alpha-mapped, and painted on simple planes to be scattered thru the ice block. A cylinder and sphere were modeled into a rough acorn and cup shape, then Subdivision Surfaces were applied to give them a nice organic smoothness. 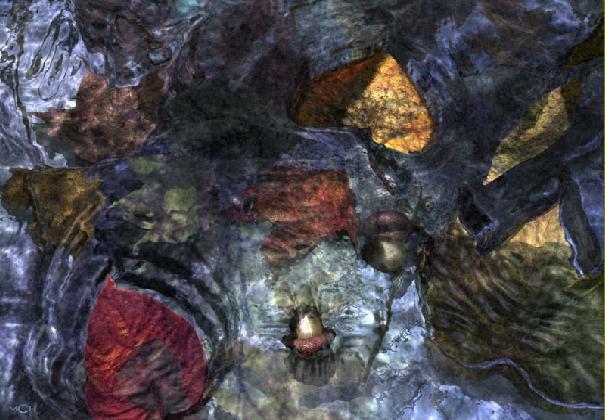 ShaderLab and Symbiont procedurals were applied, and the acorn positioned into a pit already formed in the ice object. Another walk in the park produced a photograph of an icy pond, complete with bubbles frozen beneath the surface. Painted on a plane and positioned underneath the ice object, it provides a nice subtle backdrop. Another alpha-map texture of tree branches, and one of random round bubbles were stacked in the bottom depths of the ice for randomization. Lighting is simple, a projector light with a 'branch map', one infinite for fill and another from beneath for backlighting. Scene took about a week from concept to final render. 289787 faces; SCN file size 11,250 kb, about 16 different renders. Rendered in tS5.